As the divorce rate hovers near an estimated 60% in the United States, many blame career stress as a major cause of separation. Yet, somehow, some couples grow stronger; especially when they work together. One couple who have worked together for nearly a two decades in the stressful world of multimedia—producing a magazine, radio show, and audio & video projects— has decided to share their secrets. They have appeared in a television special for TLC showing couples that you can ‘ball on a budget’ and have a lot of fun while doing it. “This just does not work without my husband. We mesh,â€ says Jenny Triplett, co-author along with her husband, Rufus, of Surviving Marriage: 13 Tips that Can Help You Get to 20 Years and Beyond. The couple has worked together professionally as co-hosts of their radio show, The Prisonworld Radio Hour, for three years and as co-editors-in-chief of their magazine, Prisonworld Magazine. However, the Tripletts say even couples who aren’t business partners are working together every day; because being in any relationship requires negotiating, compromising, and decision-making. Just think about the last time you had to decide whose mother’s house you were going to visit for Mother’s Day or where you were going to go for vacation. These decisions require compromise and skillful negotiation. The Tripletts offer advice for building the skills that they use with each other in their marriage, which enables them to live a luxurious lifestyle on a budget. As the Tripletts forge into the realm of television media with their new show, Lifestyles with Rufus and Jenny Triplett, they hope to bring the focus of diversity in the media to eye-level, as they are an African American Muslim couple; not normally seen on the small or big screens. With print, radio, TV and web under their umbrella, the Tripletts can only hope to stay on the cusp of new technology and one day ‘make it rain’ in the digital universe. 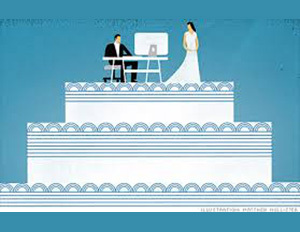 These two demonstrate that marriage, money and multimedia can successfully mix. Are you married? If so, do you believe you could work together with your spouse? Do you have a success story of being able to work with your spouse?